BOOK OF HOURS. - The Poisoned cup of Saint John. [from the Book of Hours in the Suffrages to the Saints]. The Poisoned cup of Saint John. [from the Book of Hours in the Suffrages to the Saints]. - BOOK OF HOURS. Title : The Poisoned cup of Saint John. [from the Book of Hours in the Suffrages to the Saints]..
Map maker : BOOK OF HOURS.. Size : 9.6 x 6.3 inches. / 24.5 x 16.0 cm. Description :Painted scene of the Poisoned cup of Saint John. The biblical story goes that the Emperor Diocletian offered St. John a cup of poisoned wine. He survived because he blessed the wine before he put it to his lips, the poison rose from the chalice in the shape of a serpent. 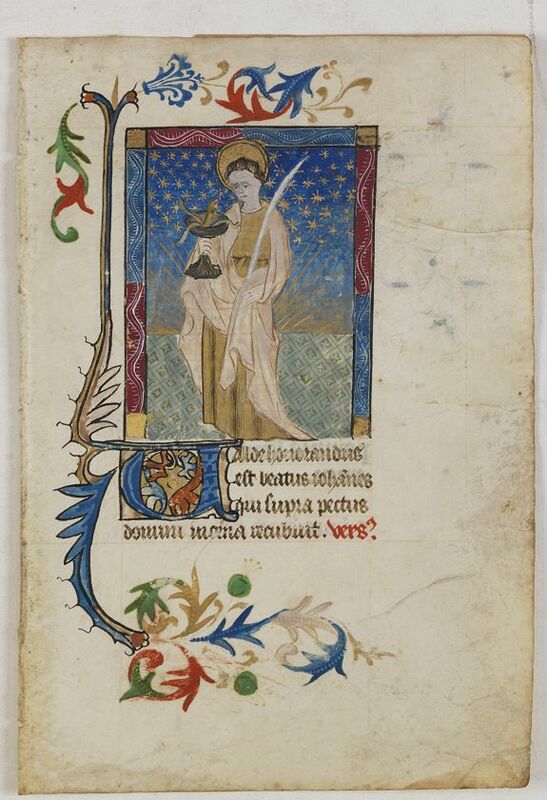 Below a decorated initial in gold leaf, vermilion, and lapis lazuli amidst foliated left side border. VERSO : 15 lines of text written in Latin, ruled in red with dark brown ink in gothic script. A decorated 2 line-initial painted in gold leaf, lapis lazuli and vermilion. Some rubrics stand out from text. Condition : Miniature leaf on vellum in lapis lazuli, vermilion, gold leaf, plant-based greens, ochre, and flake white leaf on vellum. A 4 line text written in latin with dark brown ink in gothic script on vellum a rubric at the end of the sentence. Good, but a bit browned and stained. Top margin cut into marginal decoration.